Alpamayo is one of the most conspicuous peaks in the Cordillera Blanca mountain range of the Peruvian Andes. 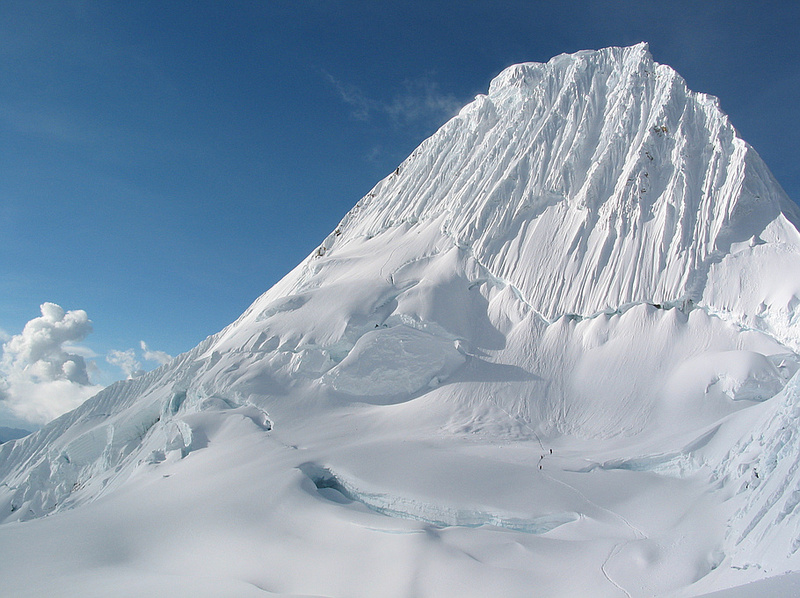 It is a steep (60 degrees), almost perfect pyramid of ice, one of a number of peaks that compose the Santa Cruz massif, the northernmost massif of the Cordillera Blanca. Although smaller than many of its neighboring peaks, it is distinguished by its unusual formation and overwhelming beauty. It actually has two sharp summits, North and South, separated by a narrow corniced ridge. Alpamayo has been named "The Most Beautiful Mountain in the World" in mountaineering circles. Most popular routes start from the village of Caraz, on the north of the Cordillera Blanca. The most common climbing route, known as the Ferrari route, is on the southwest face of the mountain. It is considered a difficult climb, demanding good crampon and ice-climbing technique. There are incomparable views of steep ice faces, penitentes, and gigantic white walls and ridges similar to the finest of the Himalayan scenery. There are at least six other climbing routes; the second most popular is the Vasque-French route.